In the following I describe how to build (from scratch) a simple Catalyst application that acts as a service bus for a collection of other Catalyst applications. The following assumes you have a working Catalyst development environment (see www.catalystframework.org for instructions). and test it in another terminal using the GET and POST wrappers from LWP. When we request the path /echo, the Catalyst dispatcher maps this to the echo() action in the Root controller. auto() decodes the string in the data parameter and stashes that value under request_data. echo() sets the echo key in the response_data stash to the same value as request_data. end() renders the current view and sets the HTTP response content to the result. The current view is the default view Service::View::JSON. This view encodes the value of the response_data key in the stash as a JSON string. With the echo example, I added a little white space to the data in the POST request highlight the fact the passed JSON string gets decoded and re-encoded, rather than just being echoed. Leave this Service application running in its terminal: we'll use it in the next example. This can be extended to cover whatever operations are required of your service bus. Now lets create a separate Catalyst application to talk to this service bus. Now when MyApp wants to post a message to the Service application, it will use http://localhost:3000 as the base of the URL used in the HTTP request. To keep our example simple, we set the response body directly in the ping_service_bus action, rather than using a view. We run can run this application in another terminal, but we have to use a different port since port 3000 is already in use by the service bus. Now that we have a skeleton service bus, we can extend its public interface (the collection of requests it accepts) and the corresponding operations it performs. Details of this a very specific to your application, but we can give some examples that highlight the use of the Catalyst framework. Suppose you have two types of applications that will connect to your service bus: a Sales application used by sales staff and an Inventory application used by warehouse staff. These applications were built independently, but it would be great if they could communicate: sales staff could know if products are already in stock; warehouse staff could be informed when stock needs to be ordered. This is something that could be accheived using a service bus. As the business grows, management might require aggregate information about both sides of the enterprise. You could build a Reports application that gathers that information via extensions you make to the service bus. With the default Catalyst namespacing, any requested path that begins with /sales/... is handled by actions in the Sales controller, and any path that begins with /inventory/ is handled by actions in the Inventory controller. Using namespaces this way, the set of paths your service bus accepts can evolve into a well structured API. Suppose we want to allow third party clients to update their product pricing. We have many third party client, but the process of updating pricing is going to be the same. In addition, we will want to restrict access to these updates to the appropriate party. We can now use standard webserver access techniques to restrict access to paths begining with /pricing/best_for_less/ to our 'Best for Less' clients. With namespacing tecniques like the above, we can construct versitle message heirarchies. We can do a lot more with this. The following are just some thoughts. It is trivial to extend our Service application to access any number of databases. Two possiblilies immediate occur. Storing elements of the service bus configuration in the database allowing us to change it on the fly. Using the service bus to marshall data between different databases. A service bus can be used as an information security layer: access is controlled at a single point and we can implement path based access rules. 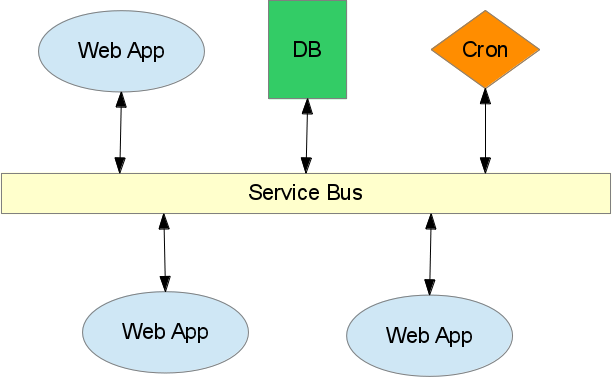 The service bus is just a web application and we can scale it in well know ways. We can have any number of load balanced Service applications or even put different instances in different locations. Service bus is purely synchronous and is not a Message Queue. But but a message queue could be a client to the service bus, or even a front-end. I would be interested to see if something similar (and more light-weight) could be done with Dancer. Great article! I just wanted to let you know it inspired me to finish up and post a blog on a related subject regarding some of the new features in recent versions of Catalyst which are aimed at assisting in building systems like this one, as well as some thoughts about related possible features in upcoming versions of Catalyst. Leaking memory all over the place.